With their enthusiasm and imaginative ways, children bring joy to our lives and make us smile. But they can also cause a little chaos in our homes- especially when it comes to toys. As much as we love our little ones, we don’t necessarily like the clutter of toys competing with our beautifully designed living spaces. What’s the solution to this problem? 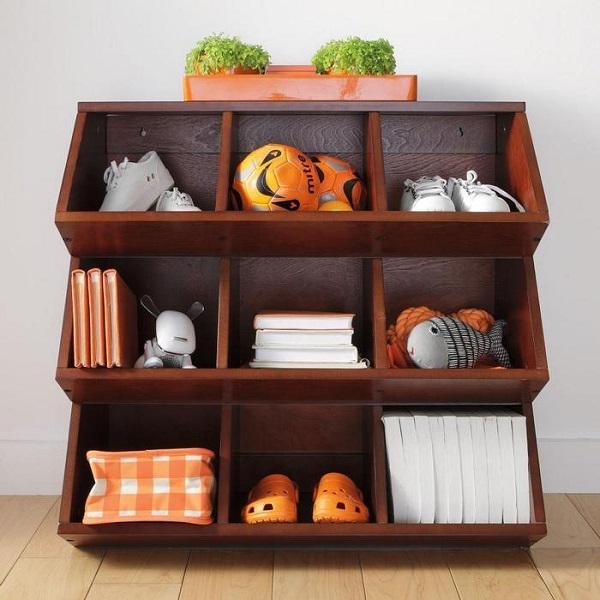 Combine necessity with style by choosing toy storage that works with the decor in your home. 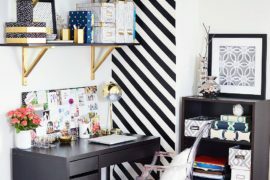 Let’s take a look at some toy storage ideas sure to please even the poshest of design enthusiasts. 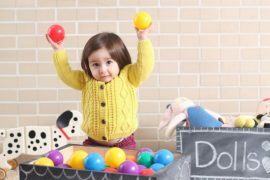 While organizing and storing toys is easier when they’re limited to the playroom, some families like the flexibility of having playtime in any space. Consider keeping toys your children play with the most in a mobile unit, like these wooden crates from Cozy. Cottage. Cute. 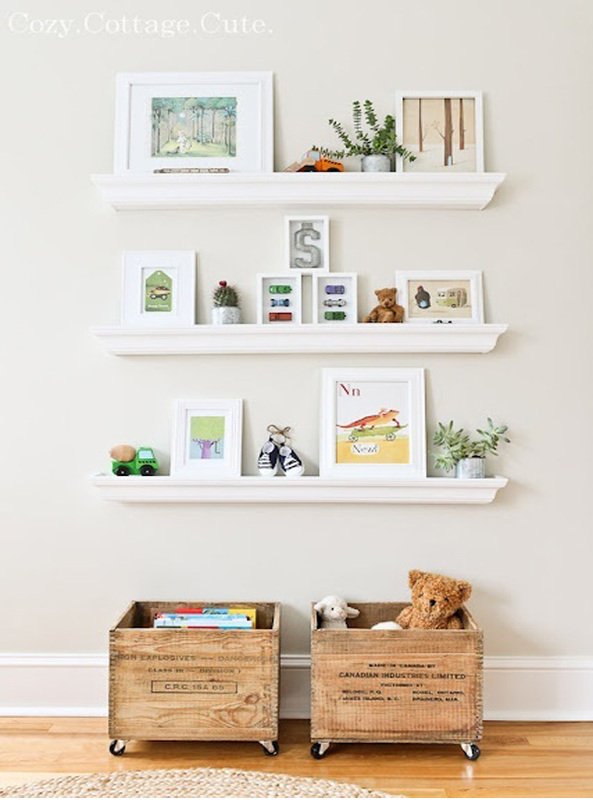 The antique dynamite crates are perfect for little hands to wheel around, and chic enough for you to keep on display. Perfect for smaller toys like Lego’s, shoe boxes can help organize little pieces so you’ll be sure they stay together. They don’t take up much room, and can be slid under a bed or stacked in a corner for convenience. 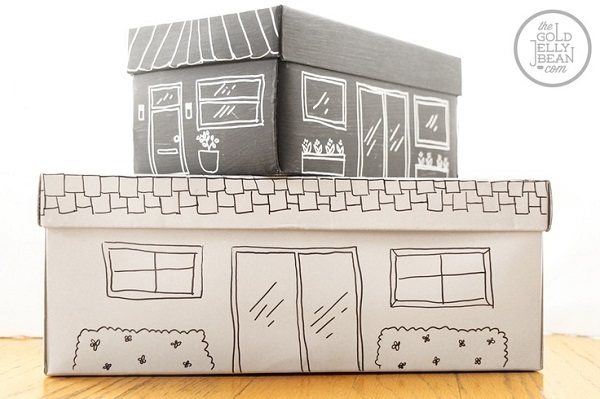 Instead of using a plain old box from your closet, try using ones that feature a design, like these from The Gold Jellybean. If you prefer an easier method for carrying toys from room to room, suitcases offer a unique storage solution. Older suitcases give a vintage vibe, while newer ones fit right in with a modern home. 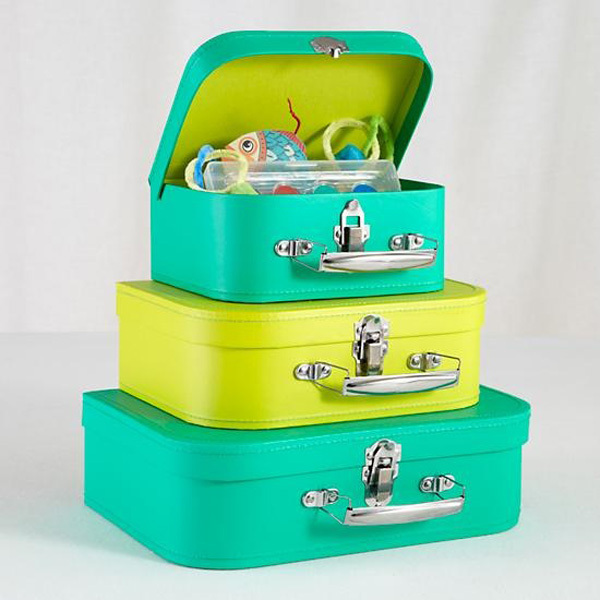 For a shock of color kids are sure to love, try finding suitcases in a fun hue like this turquoise and lime green set from The Land of Nod. Long gone are the days when our only toy storage choice was a boring, plastic bin. Now, plastic is being pushed aside in favor of a different material- canvas. We’re not talking about any average canvas bin, however. These bins add a special touch to any room. Plus, they’re durable and easy to clean. 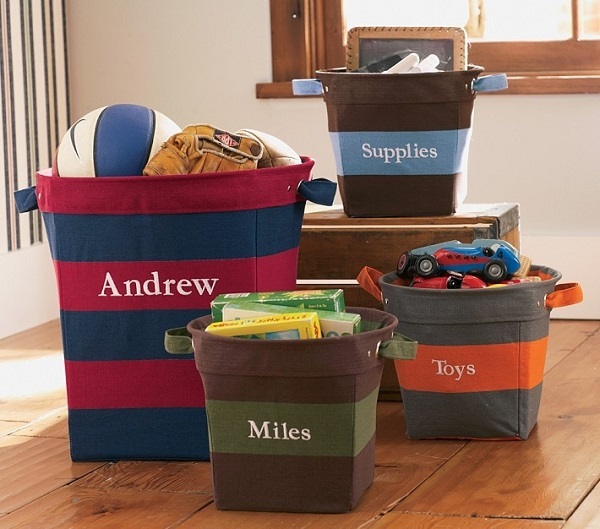 What’s great about these canvas bins from Pottery Barn Kids is the extra feature of personalized labels. If you have more than one child or just like ways to keep toys better organized, consider labeling your canvas bins. If you’re looking for a more classic look, monograms are also a great option. Canvas bins are perfect organization tools for shelving units. They’re available in a variety of sizes, so be sure to choose bins that are at least two to three inches shorter than the shelf opening. That way, they’re easy to slide in and out. 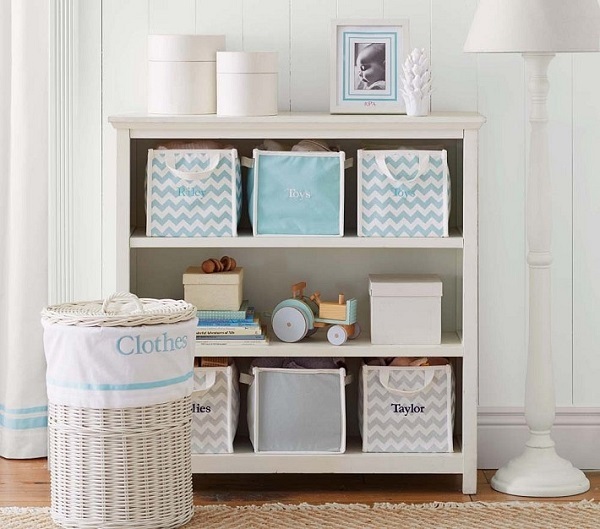 Bins that feature the color of the shelving unit in their design, like these blue and white bins from Pottery Barn Kids, create a seamless look. When you’re trying to manage the clutter of toys in your household, it’s important to have a designated place for every item. If you’re unable to dedicated an entire room to playtime, a unit like this multipurpose storage cubby from Brookstone is perfect for you. Multiple bins allow you to use as few or as many cubbies as you need for toys without sacrificing space for other items, like shoes or books. 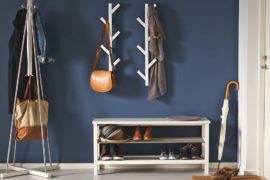 Organizers like this would work well in a mudroom or next to a back door- you can stash away outdoor toys and shoes as you enter the house. 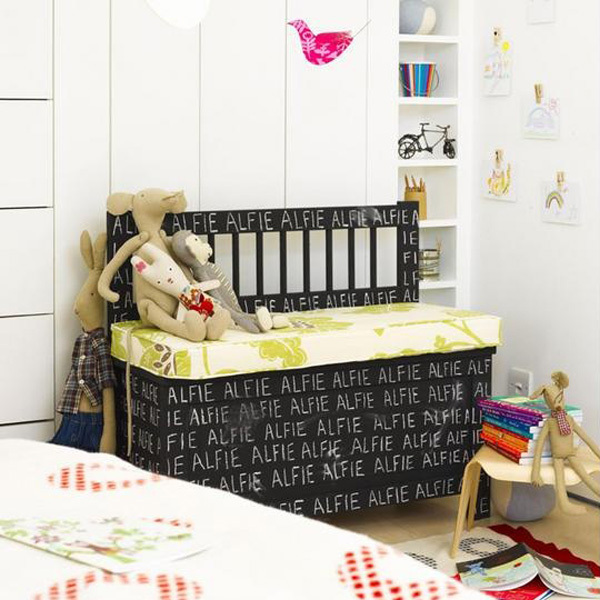 In multipurpose areas like living rooms, storing toys out of sight when not in use is a must. Furniture like ottomans or this bench from Land of Nod add seating and keep toys off the floor so the whole family can relax and move around with ease. Life is unpredictable, and you never know how your storage needs may change. 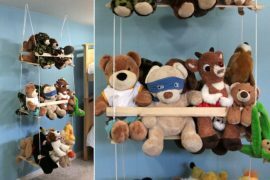 The addition of more children to your family or a move to a different home may call for a reconfiguration of your toy storage system. 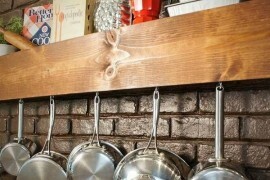 That’s why a shelving system like this one from iToyBoxes is ideal. 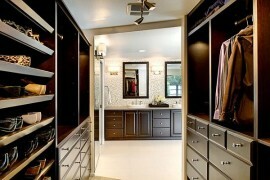 Its flexibility allows you to use a single cubby unit, or stack a few to create custom storage. 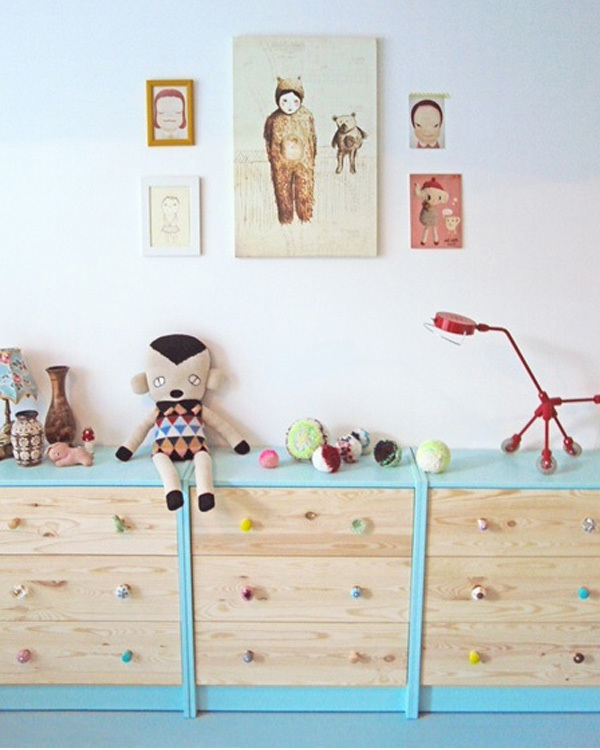 These storage ideas offer simple solutions for managing even the largest collection of toys. As long as you address your family’s personal needs, you’ll be sure to create a system that works perfectly in your home. Did this list sparked an idea? Tell us about it in a comment below.